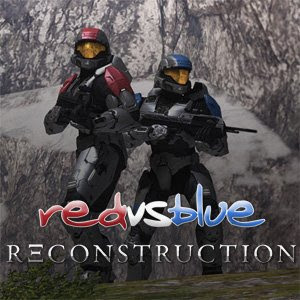 I covered Red vs. Blue a few weeks back here, but I thought it was worth revisiting the web series since its latest iteration, Red vs. Blue: Reconstruction, came to an end this week. The story picks up after the events of the original Red vs Blue: The Blood Gulch Chronicles. The Red and Blue teams have been reassigned elsewhere, leaving only Sarge and Sister behind at Blood Gulch, apparently 'locked in an epic stalemate' (Sarge refuses to leave until the Blues have finally been defeated, but his personal code of honour prevents him from harming a woman). Meanwhile, the spacecraft carrying Tex, the sentient bomb known as Andy and an alien being destined to become ruler of its species (it makes sense, trust me) has crash-landed on a remote outpost. A team sent to recover the Omega AI from the scene disappears, so special agent Washington is sent in to investigate and find out what is going on. During his travels most of the characters from the original Red vs Blue are recruited to help out, due to their lengthy experience of dealing with the freelance agents and the AIs in the original series, although Sarge's desires to destroy the Blues and ensure the death of his nemesis Grif (who is now also a sergeant, a fact Sarge's brain is biologically unable to process) once again hinder progress. Towards the end of the series a number of major revelations are made that have severe repercussions for the characters, and also explain a number of lingering plot mysteries stretching back all the way to the start of The Blood Gulch Chronicles. Reconstruction adopts a slightly different tone to the previous one. Whilst The Blood Gulch Chronicles was an out-and-out comedy with dramatic undertones, this is reversed in Reconstruction, which follows the drama first and foremost and weaves the comedy into the narrative. As well as a creative choice, this was also probably a result of the more advanced technology involved. The original Halo engine didn't allow for much in the way of drama or characterisation and everything hinged on the voice acting and the easiest way to hook an audience in was with humour. For Reconstruction, the Halo 3 engine is used which is far more impressive. Bungie also gave the creators, Rooster Teeth, access to camera shots and effects which weren't previously available. Reconstruction also focuses on a new character, Agent Washington, and the established characters play a more secondary role in the narrative to his mission. Each episode is also introduced by letters being exchanged between different parts of the military hierarchy outlining the political and military consequences of events in the series. Whilst Reconstruction (****) takes a somewhat more serious tack, there's still plenty of laughs involved and the story is interesting, explaining as it does a lot of the backplot to the original series. There are also increasing signs that the creators are looking at tying the series into the Halo fictional universe: a single mention of Master Chief and the Covenant aside in the original series, it had been broadly assumed that the series stood on its own, but constant mentions of a war between humanity and an alien race and a late-series mention of the UNSC suggest otherwise. You can watch all 19 episodes of Reconstruction on Rooster Teeth's own website here, or via YouTube. The series will be released on DVD next month.